With its 45 mm titanium case, its gray ‘stealth' look, its ‘Military rubber' strap and its high-performance mechanical movement, the new Avenger Bandit more forcefully than ever embodies daring feats and extreme missions. 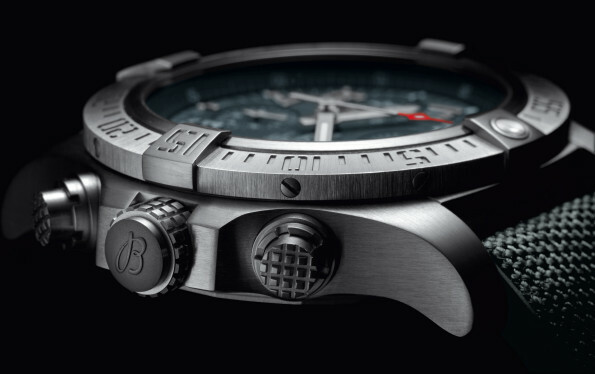 Within the Breitling world, the Avenger reflects all the power of these “ocean fortresses”and their high-tech universe entirely dedicated to performance. The new Avenger Bandit confirms this exceptional vocation. The light, ultra-sturdy titanium case, a favorite metal in the field of aviation, displays a generous 45 mm diameter enhanced by protective lateral reinforcements; its satin-brushed finishes eliminate any undesirable glinting in the heat of action. The dial is distinguished by its gray color with tone-on-tone counters accentuated by a finely snailed raised motif; it features vigorous aviation-inspired stencil-type numerals, with a luminescent coating ensuring excellent visibility further enhanced by the thick sapphire crystal glareproofed on both sides. The bezel, also adorned with engraved stencil-type numerals, stands out with its four rider tabs (a classic Breitling signature feature) serving to memorize times. The non-slip grip of the screw-locked crown and the chronograph pushpieces ensures optimal handling, even with gloves. The titanium caseback is adorned with a conversion scale for the main units. An authentic instrument for professionals, the Avenger Bandit is equipped with a brand-new strap secured by a titanium folding clasp and combining a sophisticated rubber tread on the wrist side with an anthracite high-tech Military textile fiber exterior. The result is impeccable resistance teamed with maximum comfort and flexibility. Water-resistant to 300 m/1,000 ft, this gem of power and technicality houses a selfwinding chronograph movement: Breitling Caliber 13, officially chronometer-certified by the COSC (Swiss Official Chronometer Testing Institute), a token of superior reliability and precision. Avenger Bandit: the entire spirit of naval aviation on the wrist. 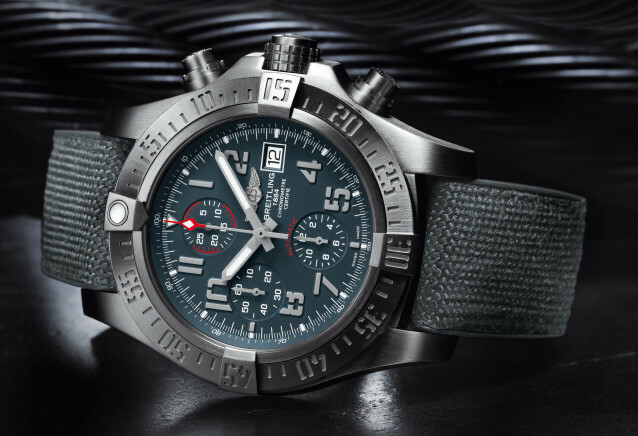 Movement: Caliber Breitling 13, officially chronometer-certified by the COSC, selfwinding, high-frequency (28,800 vibrations per hour), 25 jewels. 1/4th of a second chronograph, 30-minute and 12-hour totalizers. Calendar. Case: titanium. Waterresistant to 300 m/1,000 ft. Screw-locked crown. Unidirectional ratcheted rotating bezel. Cambered sapphire crystal, glareproofed on both sides. Diameter: 45 mm. Dial: Titanium gray. Strap: Military rubber.